I am a math geek. I fell in love with math when I was in the 5th grade and have been in love ever since. One thing (out of many) that I love about math is how you can attack a problem from many angles and have several valid solutions. Another thing I love about math is the kind of (magical) tricks that you can do with it. It's not literally magical, but it can astonish other people who have a hard time understanding it. For me, any little trick that I can learn to speed up my own mental calculation is already a good thing - impressing others is just a nice bonus to that skill. Mathemagics contains many quizzes to help sharpen your math skills. Mathemagics is a great app that allows you to learn small math tricks to sharpen your mental calculation (and possibly impress others). There are more than 50 different tricks that you can learn, practice and test from within the app, ranging from simple multiplication and division tricks to check sum algorithms that you typically encounter in Computer Science courses. The app also has awards for each trick that are designed to motivate you to work your way up from an apprentice to a mathemagician. The more you answer correctly, the higher you will rank. As a math geek, I know several math tricks that can be applied to everyday situation. However, I am still impressed by how easy some of the tricks presented in this app are. Here's an example that hopefully will illustrate my point. 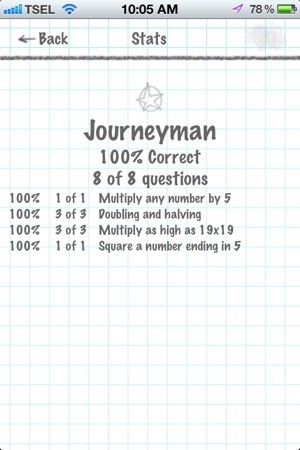 The first trick in the app is to quickly multiply two numbers, each within the range of 11 and 19, e.g. 17 x 18. The app teaches you to add the bigger number (18) with the last digit of the smaller number (7) and add a zero at the end of the result (250). Then, you add a multiplication of those last digits (8 x 7) into the previous result to achieve the final result, i.e. 306. Assuming that a and b are single digits, this proves the trick above. (10+a+b) illustrates how you can add the last digit of the smaller number to the bigger number, whether the bigger number is (10+a) or (10+b). This is actually not the trick that impresses me most, but I hope this helps to illustrate that the tricks in this app are all legit. Multiple topics can be included in a quiz. Obviously, you can learn a trick or two from the app. But the most important thing that you can learn is the fact that as with many other skills, you also need to practice on a regular basis. By selecting several math tricks in a single "play", you'll be presented with different kinds of problems. You may not know which trick to use, which is not at all uncommon in daily life. However, as you practice more, you will eventually be able to instinctively tell how to solve a problem. Always remember that practice makes perfect. Having this app, though, really helps you practice in small increments on a daily basis. If you're turned off by math, then obviously this is not an app for you. But if you're a bit curious about the skills you might pick up here, then I'm certain that you'll be satisfied within the first few tricks.